Valerie: We sang 9 Oms to settle the energy in the room. Works beautifully. It is the First of November, 2016. 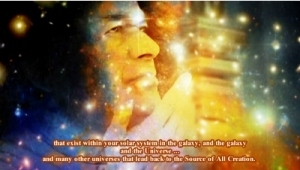 And we are gathered here with love and respect for Cosmic Sai Baba. And we are asking Him to make his Presence here, among us. ❝I am here! And I am very pleased to be here. I have said it before that I have been here for quite some time and I have been listening to the conversation. And I am pleased to hear the inter-action that has taken place – and for those who are reading this transmission that will go onto the website – I would encourage that they have meetings similar to what you are having here. And call upon God or The Source of Creation of All – that is all you have to link with and call from the Highest Order – you can call upon me if you like or any other from the Angelic Realms. A Light Being that you trust and have worked with. These are the things that can help, because we are all here to help the little Earthling to evolve upon this planet you call Earth. And so anything that is not of your Earth – or not sitting on your Earth it is ‘Extra-terrestrial.’ It is that simple. It is not something to shy away from or to worry about. There are many, many different races, as I have said before, that exist in other worlds and other planets. This you will come to understand and realise as science progresses and searches the galaxies and they will find … that there is much more out there than they realise at first. They have the technology to search. And that will increase – more and more will come. More and more is already coming from say 5 or 10 years ago. So please do not worry about Extra-terrestrials – they are not going to come and take over this planet. There are some that would like to – but that has gone now. That is a time … THAT WAS A TIME THAT WAS – BUT IT IS NO LONGER. They will not be allowed to come and take over. It is against the Universal Law and that will be upheld. So I would like you to think about that. There is not going to be a galactic war or a war upon your planet to take over or to stop taking over … not at all. But there exist those who are enlightened and much wiser and experienced because they have already been through all these things that the planet Earth is going through – and they know nothing can be solved by war, nothing can be solved by the misuse of power – nothing can be solved by the use of much money, far from it. But money exists … as payment of sales … of what exists on your planet and so treat it as an energy – do not misuse it – share it – and allow it to flow, in the same way that you are encouraged to allow your thoughts to flow. And to focus on things that are positive because there are many things that are negative upon your Earth. But you only give energy to anything that is negative, if you focus upon it. So just disallow it in your thoughts. And share your love – your universal love that is in your hearts, because you are God Beings. It has already been talked about this morning – you are Universal Beings, you come from the Creative Source of All. You are God Beings, you have the ability to be able to become totally unlimited in the way that you think and do things. But always with a good outcome. Does that make some sense? I would like you to think about that – and encourage others to think about that. You have religions that teach it. And this is what religions were meant for. Some of the teachings have been lost unfortunately – and so you need to go within your hearts – within your Soul – which is at the Seat of your Heart and listen to the ‘Voice Within’ because that is where your answers are. That is where you will always know the right choices to make.